It started innocently enough last summer. A consecutive string of down days, followed by a bounce. The remarkable downward price slide in the price of crude and its related impacts are now front-page news. I’ll let the experts debate the reasons why prices have been cut in half in just a few short months, and let others prognosticate on when it will stabilize. What I would like to do here is comment on some interesting phenomena that have occurred and a few reasons why all this is good for the futures industry. A 2 percent daily move from high to low when price is $100 provides $2,000 per contract of available trading “opportunity.” And now, with price at $50, that same 2 percent fluctuation will only produce a $1 move, which equates to $1,000 per contract. So if traders were normally trading X number of contracts per trade at $100, then to achieve the same daily results, they should be trading twice as many contracts with the price cut in half down to $50. But it doesn’t work that way in practice. While some might view that available “opportunity” as potential profit, a seasoned, experienced trader (and their battle-proven risk manager) will view that range as potential risk. Interestingly, while price has declined along with increased volume, average daily volatility has doubled. Look at the next chart below. This chart displays the daily true range as a 10-day running average. (The daily range values have been normalized to a percentage basis to equally compare the lower prices with higher prices). Prior to the middle of 2014, prices typically fluctuated by approximately a 1-2 percent daily range; now with the recent decline, they are moving upwards of 4 percent each and every day. So back to our previous “opportunity math.” Prices are now at $50, but average daily ranges have increased above 4 percent. That means that even though price has been cut in half, the daily price fluctuations (approximately $2 per day) are roughly the same as they were previously when measured on a constant dollar basis. So theoretically, a trader can trade the same number of contracts at these lower prices to attempt to capture a portion of the same $2 average daily range. And their constant dollar risk is still the same at $2,000, even though we are trading at much lower price levels. In actuality, if the trader is risk managed on a percentage basis, they should be trading fewer contracts because of the greater percentage risk inherent in the increased volatility. So if the same dollar value of opportunity is still available, and risk observant traders should be trading the same or fewer number of contracts per trade, why has daily trading volume significantly increased? Traders trade more in this type of environment simply because they can. The price discovery process constantly probes to produce the best possible agreement of current value. The repeated probing to new lows in the past six months creates significant uncertainty. This powerful combination produces volatility, as price continually pushes and retraces. Traders crave volatility, and money and trading activity gravitates to markets that move. This is an overly simplified analysis, of course. But extended price moves like this amplify the benefits provided by futures markets. The risk transfer mechanism of hedges put in place against the threat of higher prices may seem counter productive when prices fall and losses occur in those hedges. But hedging programs are not static, and they undergo continual evaluation. New hedges established at these lower prices help better manage the future costs of expected needs. And these new hedges, along with modifications to existing hedges, increase the activity of those parties in the markets. While there are significant negative economic ramifications from the price drop, the increased trading volume is beneficial to many futures industry participants. More contracts traded equals more fees for exchanges and FCMs. More volatility provides more trading opportunities for traders and funds. And the increased volatility means greater scrutiny from risk managers. And all of this activity drives increased demands from industry participants for superior tools and reliable, performant system infrastructure. The entire futures industry becomes more alive and vibrant from the increased activity. 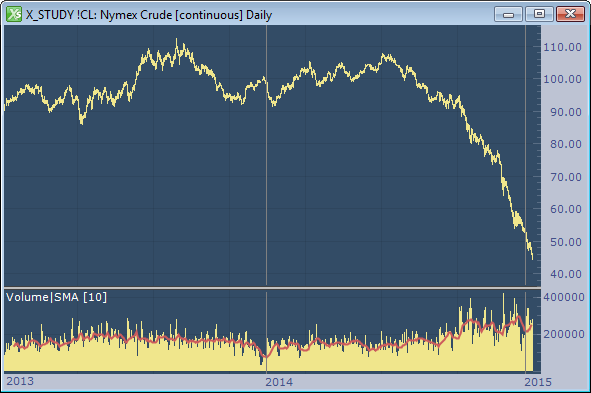 So next time you marvel at the remarkably low prices at the pump, remember that the futures industry is smiling also.